How to write a Technology Sale Agreement, Exclusive? 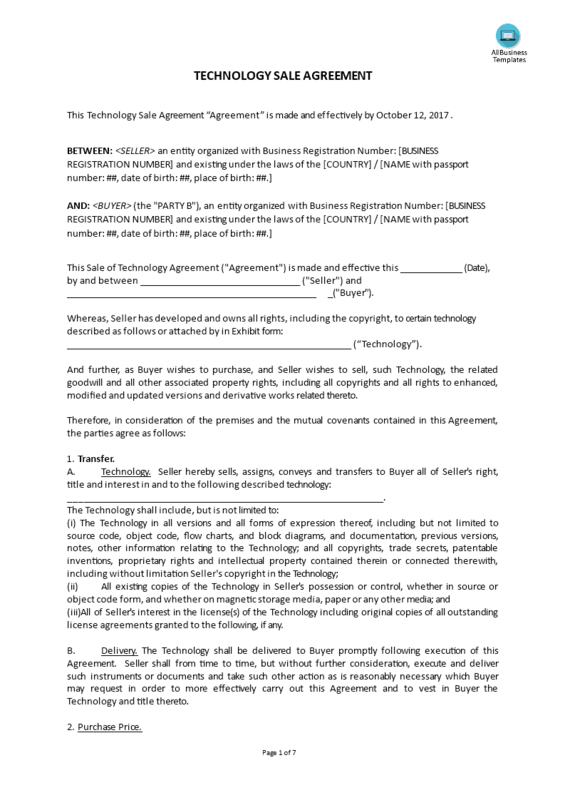 Download this legal Technology Sale Agreement, Exclusive template now if you ask yourself this question! Legal communication is essential to companies to ensure truthful, accurate information exchange and has morally-correct decision making. Companies need to give consideration to how they communicate and remain lawful in their day-to-day business activities. Therefore, communication in situations that involve legal complications, request extra attention. Using our ready-to-use and easy-to-modify Technology Sale Agreement, Exclusive. This ready-to-use and easy-to-customize blank legal template address your demands well and is suitable for any kind of personalized legal matter. This Technology Sale Agreement “Agreement” is made and effectively by October 7, 2017. Our trustworthy legal templates are all drafted and screened by legal professionals that have experience in special law-related fields and are actively involved in legal issues around the topic. The 3 step process virtually guarantees you can finish and print your legal document in minutes! Feel free to download our basic or advanced template designs, they are intuitive and in several kinds of formats. This Technology Sale Agreement, Exclusive template covers the most important subjects and will help you to structure and communicate in a professional and legal way with the stakeholders involved. Download this professional Exclusive Technology Sale Agreement template if you find yourself in this situation and save yourself time, efforts and possibly reduce the lawyer-fees! Using our legal templates will help you to deal with the situation! However, this template will help you dealing with this legal matter, we still recommend you to consider to find legal support in case you have doubts dealing with it the right way. Also interested in other Legal templates? Just search on our website and have instant access to thousands of free and premium legal agreements, contract, documents, forms, letters, etc., which are used by professionals in your industry. For example Real estate forms, Employment forms, General release bank account, Power of attorney, Joint Venture Agreement, Letter of intent, Last will & testament, Secrecy Agreement, Articles of Incorporation of Company, Agreement with Accountant, Purchase contract, Agreement for permission to sublet and much more. All business templates are easy to find, crafted by professionals, ready to use, easy to customize and intuitive. Pay close attention to the available legal template by browsing through the list. Take the time to review and choose the variety of legal templates to suits your needs.